The first thing you notice about Dale's Pale Ale is its very plain looking red-white-and-blue can that looks more like a 70's macro than a cutting-edge craft-brew. I'm not about to start judging beer on it's packaging any time soon. In fact, a lot of the time I've found a plain label can be a statement of confidence in the product itself. And after enjoying another Oskar Blues offering, Old Chub, so much, I have some pretty high hopes for Dale's and the other OB beers showing up in shops here in Houston (and my fridge): Ten Fidy and Gordon. 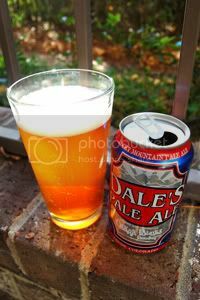 Dale's Pale Ale is Oskar Blues' flagship beer, and, according to them, America's first hand-canned craft beer. Its racked up a number of mentions and awards from many mainstream publications including The New York Times, Details, & Men's Journal. A heaping post-boil addition of Centennial hops pushes this beer into an area that the brewer calls "somewhere between an American Pale Ale and an India Pale Ale." The can chimes in describing the brew as "a huge, voluminously hopped mutha of a Pale Ale." Well, one thing I'm going to be expecting inside this can is a decent amount of hops. Appearance: A hazy, yet bubbly, carrot-orange body with a one-finger, white head that leaves good lacing. Aroma: The can didn't lie, this is one heavily-hopped beer. The hops slap you in the face well before you even start pouring the beer into the glass. Grapefruit dominates in the hop department, with orange-peel and pine bringing in the rear. As for malt, there isn't much shining through. This really seems more like an IPA than a Pale Ale. Taste: Very bitter, citrusy hops off the bat. Grapefruit is still very much the focus, with the pine and orange-peel only slightly more prominent than before. The malt isn't completely choked out by the hops, and has a clean, caramel character. I would have liked to see just a little more of a balance between the hops and malt here, but these hops are good enough to make up for it. The aftertaste is decidedly bitter and, at times, a little soapy. Mouthfeel: Sticky and medium-bodied with moderate carbonation. The pleasantly bitter aftertaste lingers a long time. Drinkability: Due to the bitter character and moderately-high 6.5% ABV, only committed hopheads are going to be chugging this all night long. However, this is certainly an easily drinkable beer for anyone who isn't allergic to hops. Verdict: Dale's is certainly no slouch, but it's lacking just a little bit of malt to be perfectly balanced. To me, and apparently Oskar Blues themselves, Dale's clocks in somewhere between an IPA and an APA. One thing I can say for sure though, this is the hoppiest canned brew I've ever encountered, and that has to count for something.